Moron 5 and the Crying Lady is topbilled by (L-R, standing) DJ Durano, Billy Crawford, Luis Manzano, Marvin Agustin, and Martin Escudero. The Crying Lady mentioned in the movie's title refers to comedian John Lapus (right). 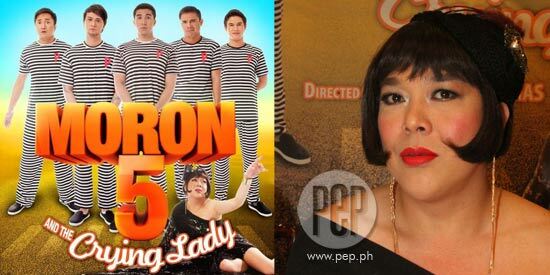 Moron 5 and The Crying Lady benefits greatly from the comedic abilities of John "Sweet" Lapus, and it is not surprising that the film's funniest moments had the TV host-comedian in its center. Sadly, John is not the star of this new comedy film from Viva Films, but the titular moron 5, composed of Billy Crawford, Luis Manzano, Martin Escudero, Marvin Agustin, and DJ Durano. While these five are credible actors in their own right, their comedic abilities are still lacking. Moron 5 and The Crying Lady tells the story of five friends who are depicted to be stupid. They cross the path of a gay man who has a grudge against them, so much that the gay man, played by John Lapus, will do anything to bring them down. A director of a comedy film should rely on its lead actors to make the film work. This is why the films of terrific comedians like Vice Ganda, Ai-Ai delas Alas and Eugene Domingo are big hits on the box office. In Moron 5, director Wenn Deramas relies on five actors whose fortes are not in comedy. The result is a hit-or-miss affair, comedy-wise, with some jokes falling flat because the actor delivering it was trying too hard. There is not much trait to distinguish between any of the five actors. They are so interchangeable—they act the same way, and throw jokes the same way—that it gets confusing at times. It is most apparent when the film goes to a flashback when the five characters were kids. The viewers are lost and it is never made clear who is who among the kids. You feel like a better casting decision should have been made, or the appearance of the actors should have been altered. For instance, one can have darker skin, one could be secretly gay, or one could have a ridiculous afro, just to help viewers distinguish them from one another. It also does not help that the film seems to not have a solid narrative structure. Whole plot points and characters are introduced just for laughs, then dropped later on. At one point, a full-on ramble happens in prison, to which no consequences were meted out. It is also unclear why the five characters are morons. Are they really mentally retarded, or just pretending to be stupid? One character even knows how to drive a car. To be fair, there were moments in Moron 5 and The Crying Lady that are truly hilarious. In fact, John Lapus's monologue at the film's climax was really funny and that monologue may be worth the price of a movie ticket. Moron 5 and The Crying Lady, directed by Wenn Deramas and produced by Viva Films, is now showing in theaters nationwide.